To be completely free of faults and defects, right? Just about anything you can think of is more interesting for its flaws and defects. A perfectly straight and tall tree may be a sight to see, but I could stare much longer at a tree that had some lean years. It will be all the more interesting for its twists and bends, and I will be filled with admiration of how strong it must be to continue to grow tall beyond those lean times. Even perfect supermodels are known for their flaws, as minute as they may be. A gap in the tooth, a mole, different eye colors. It makes them more interesting, they stand out in the sea of flawless perfection. And what of our visions of perfect children? 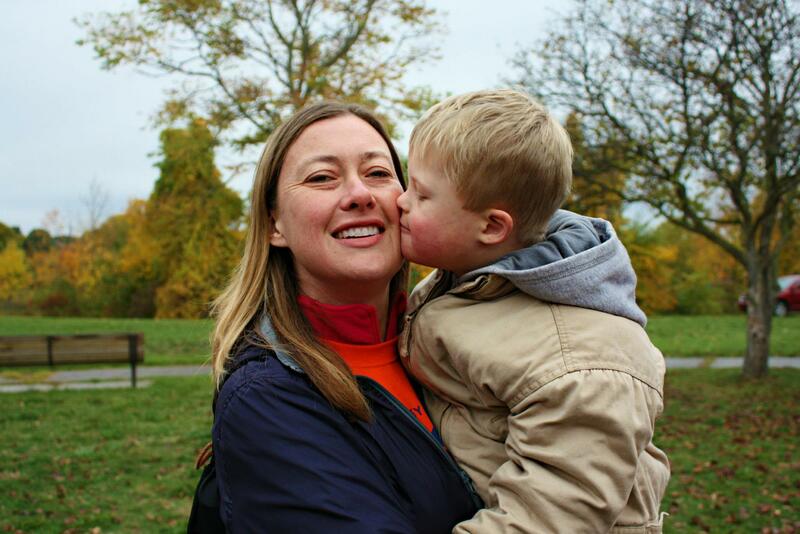 My son has 47 chromosomes, while to be “perfect” is to have 46. Shocking though it may seem, some people actually decide to terminate a pregnancy over this itty, bitty additional chromosome. Yes, sadly, deep down, many of us are hung up on perfection. I’m here to tell you its A-Ok to be imperfect. In fact, imperfections are what can actually bring us closer to what we are looking for in perfect. I believe that in perfect, we are looking for happiness. If we have the perfect body, the perfect house, the perfect job, the perfect spouse, the perfect children, then that will bring us happiness. WAAAHHHHH (that’s my attempt at typing the red buzzer sound). Wrong answer, try again! Those things can bring us some satisfaction and comfort, most definitely. But, all of those things could change due to circumstances. What brings happiness and gratification is accepting imperfections, and doing the best with what we are given. Have you ever achieved something you didn’t think you could do? THAT brings happiness and gratification. Have you ever encouraged someone to reach a goal, and then watched them achieve it? THAT brings happiness and gratification. Those experiences are not material, so can not be taken away. These achievements also have the power to encourage you and fill you with confidence to achieve even more. It’s a gratifying cycle that keeps on giving. Sure, it’s not easy, but that is a big part of what is so gratifying about it. Working diligently and persistently makes the achievement all the sweeter. Instant gratification is wonderful, and needed in our daily lives, to give us a spring in our step to encourage us to move forward. But, its achieving the difficult challenges the bring us deep, lasting joy. The point I’m trying to make is just because a project or even a human life doesn’t look the way we want it to, and we fear the challenges, doesn’t mean that we should give up on it. I am here to tell you that my son’s itty bitty chromosome is nothing to fear, quite the opposite. I won’t pour sugar all over this and tell you its easy, but I can not think of a single day that my son did not bring immense happiness and gratification to our lives. Thanks to my son, and his 47 chromosomes, I’ve also been privileged to meet some amazing people I never would have before. I will forever be grateful to Wil’s speech therapist, Theresa, and Service Coordinator, Beckie, when Wil was born. 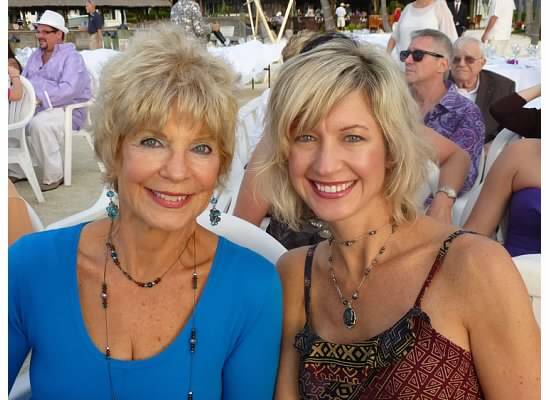 These two incredible women took our family under their wing and prepared us to fly. They worked tirelessly and lovingly with Wil, and we all jumped for joy together with his every achievement. 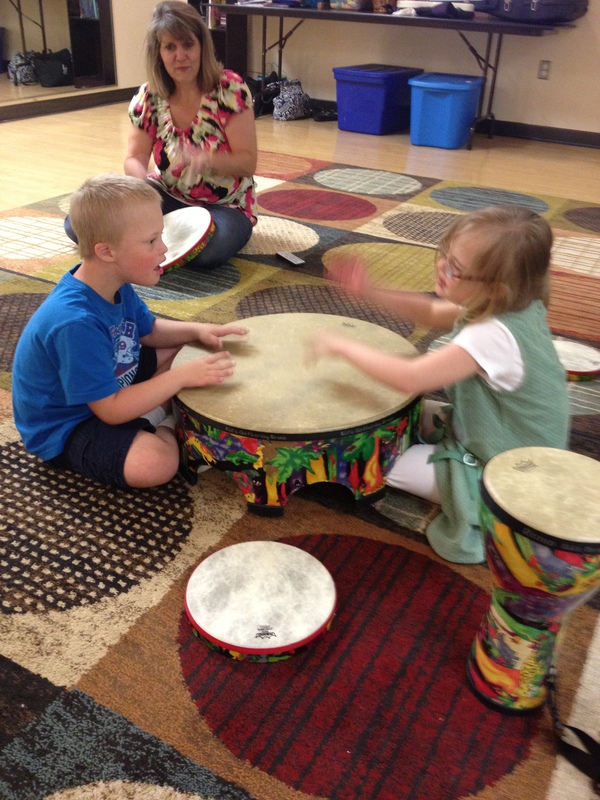 I saw first-hand how they would find ways to engage Wil and help him learn. I saw how hard he worked and the look of pride when it clicked and he mentally understood or could physically do the task. Both to see that achievement, and be part of encouraging it, is pure happiness, joy, and gratitude to those who helped and encouraged him. The challenges grow larger as Wil gets older, but so then, do the successes grow larger. As I mentioned earlier, the more achievements accomplished, the more confidence built. I know that we will handle the challenges as they come, and our strength, joy and gratitude will grow with them. Ahhh, now that is true Perfection! Wil is quick to laugh, and loves to be around people. He’s also a lover of sports. Put that together, and to me that spells T.E.A.M.P.L.A.Y.E.R. I do not want to rush his childhood along, but I sure do look forward to the day when he is 8 years old and can join the Special Olympics basketball team. He will thoroughly enjoy and thrive in the camaraderie of a team atmosphere. When Wil and I are practicing basketball in the driveway, if he shoots a hoop, he jumps up and cheers. Even though he is very proud of himself, he gladly hands over the ball to me for my turn. When I make a basket, he cheers just as loudly for me, as he did for himself. Yes, he was made for team sports! A few years ago, at the Seattle Special Olympics, nine contestants, all physically or intellectually disabled, assembled at the starting line for the 100-yard dash. At the sound of the gun, they all started out, not exactly in a dash, but with a relish to run the race to the finish and win. The other eight heard the boy cry. They slowed down and looked back. Then they all turned around and went back……every one of them. Everyone in the stadium stood, and the cheering went on for several minutes. That is true sportsmanship, and I am both thankful and proud to have the opportunity to cheer on our future Special Olympian. Just as these 9 teammates demonstrated, Wil has the drive to do his personal best, but will not hesitate to stop to lift up a fallen friend. Those teammates may have an “intellectually disabled” label put on them, but I’d say they are darn smart! Yesterday afternoon, we had the PBS station on TV, and they were interviewing a man who couldn’t speak well due to a disability. Katherine was very interested in hearing this man’s story, because she knows how hard he has to work for the things she takes for granted. Katherine and her twin sister, Elizabeth, have learned a lot growing up with their brother, Wil. 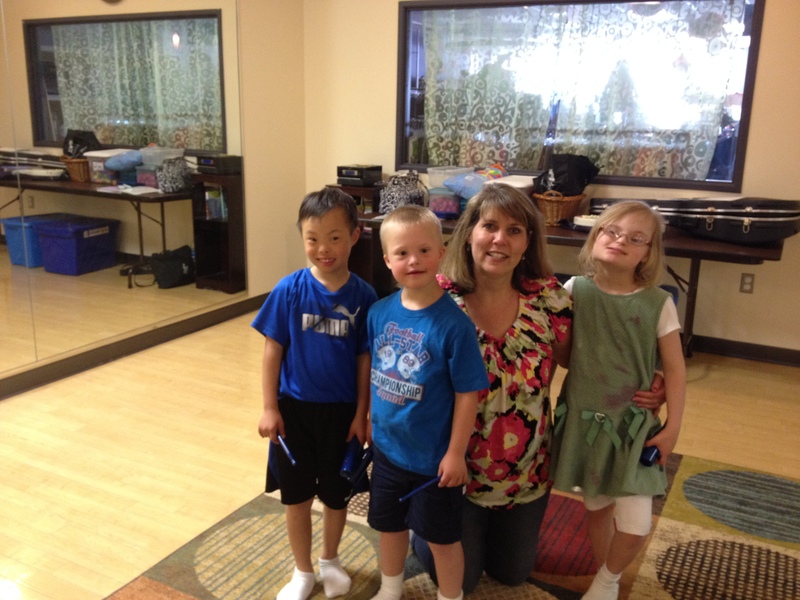 Their first questions about their brother’s Down syndrome came up when he turned 5. They realized he wasn’t speaking at the same level as they were at 5 years old. The girls had vivid memories of that age, and what they were doing in Kindergarten. They recognized that Wil hadn’t achieved all of the milestones they had at that age. The twins are only 20 months older than Wil, so in their memories, he has always been part of their lives. When Wil was only a few months old, his therapists visited our home on a regular basis. Its simply what the girls knew as the norm, and they would help him with his exercises. There were no questions, it just was. I simply answered that Wil was born with something called Down syndrome, and he will do all the things they can, he just needs some extra help so it may take him longer. They understood that, and went on their merry way. They continue to ask questions, and continue to help Wil with his exercises and therapy. I believe this has greatly opened their minds to appreciate the differences in others. Working with Wil, they realize the patience and encouragement it takes, and how hard he tries to do things they do with ease. Wil loves playing with balloons, so his physical therapist recommended that he practice repeatedly bopping a balloon in the air to build upper body strength and coordination. Wil’s sister, Elizabeth, enjoys doing this balloon activity with him, and Wil adores his big sister. He will play longer and work harder for her, and she likes being his “big helper.” Its a win/win. 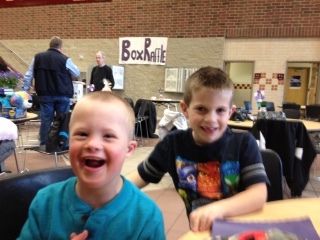 Wil has the stereotypical stubbornness associated with Down syndrome. If he does not want to do something, he might plop down on the ground, hide under the table, or simply sit there and not cooperate. Wil’s teacher assistant has done wonders with him in this respect, and has found tools to “outstubborn him” as she likes to call it. Though these tools she shared with me are very helpful, sometimes that stubbornness still reals its unmoving head, especially when he is tired. One night, Wil and I were trying to get through his homework, and he was struggling. He was getting upset, and was refusing to work. 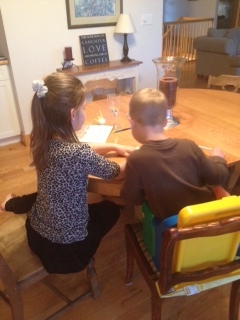 Katherine asked if she could sit with him and help with his homework. When she sat down, I swear I saw that stubbornness evaporate like a vapor before my eyes. He looked at her adoringly and hung on to every word. On his homework, two die were pictured. One die had one dot, the other had two dots. He was to add them. We have 3 bean bags in our living room, so Katherine got up, and demonstrated with the bean bags how two come together with one to make three. Wil had his last Music Together class last night. It is also a wonderful learning tool for him. If you sing Wil a song, he will comprehend and retain what is being taught much quicker than if it is spoken to him. In school, he’s learned the days of the week, how to spell red, blue, green, and countless other concepts through song. Since Wil was a newborn, my dad has sung “You Are My Sunshine” to Wil. Wil adores this, and they now sing it together every time they see each other. Wil was able to sing the entirety of that song before he could put two words together in a regularly spoken sentence. When Wil and I are driving in the car together, if I don’t have the radio on, he’ll start singing his own songs to entertain himself. It’s the cutest darn thing, and I’m so impressed with how easily he finds ways to keep himself happy and busy. I hope he never outgrows this habit of singing just for the pure joy of it. It not only lifts him up, but anyone in his circumference. I’ve adopted his habit of impromptu singing. Now, when I find myself doing mundane tasks like washing dishes, chopping veggies, or weeding, I sing. I find I do a better job, and I enjoy what I’m doing, rather than just getting through another daily task. Wil has taught me so many things that are seemingly simple, yet bring so much more joy and fulfillment to life. Wil teaches his lessons in one of my favorite ways. He doesn’t push his ideas on anyone, or preach what’s right or wrong. He teaches by doing. We need only observe Wil being Wil, to learn. I do enjoy seeing new styles and new makeup ideas, but what I laugh at is, how they dictate what is hot and what is not. How did they become the authority on what looks good on each of us? What’s hot for one, may look ridiculous on another. There was a time when I listened to these fashion authorities, and took their advice to heart. It was of high importance that I wear certain brands from certain stores. Even if I could only have one pair of jeans, instead of 10 at the discount store, I chose to have the one pair. I’ve broken out of that fashion jail, and now live in fashion freedom. I dress in clothes that are an extension of my personality, rather than within the confines of the fashion police. They are too busy with the likes of Honey Boo Boo to mess with me, anyway. I was in 4th grade, and my grandparents came to stay with my sister and me, while my parents were out of town for a few days. Before school one morning, as my sister and I were about to run out to catch the school bus, a heavy rain started. I had outgrown my raincoat, so my grandmother promptly cut three holes in a large, black plastic garbage bag, and plopped it over my head. I immediately cried in protest. No one outwardly made fun of me, and I think some of it had to do with my disposition. I was absolutely mortified, but I was more than prepared to duke it out with a teasing kid rather than combat my strong-willed grandmother. It has taken many years, but I’ve finally come to her way of thinking. No, I don’t confidently strut around in garbage bags when it rains, or request Mr. Klein stitch out my name on the back pocket of his jeans, and that will be $80, thank you very much, but, I get where she was coming from. What looks good on you is not what someone tells you looks good on you. Be your own person, and be proud of who that person is. Years later, shortly after my grandmother passed away, I remember Julia Roberts married Lyle Lovett. It was a shock to many, as she is stunningly beautiful, and Lyle is, well, Lyle. Yes, she is my grandmother’s daughter. With one big difference, she would never send me off to school in a black garbage bag(though we still have some good laughs about it!). My mom values fashion and has an admirable sense of it. She believes in confidently wearing things that are “you” as an expression of who you are. She doesn’t follow any fashion rules, she follows her own. My mother has a beautiful, creative taste in clothes. Some of her outfits might look outlandish on some, but she never fails to pull it off looking fabulous. That is because her clothes are an extension of her true, fun and energetic self.